Our licensed HVAC repair technicians provide fast, professional and reliable home furnace repair which has earned them a trustworthy reputation around the Denver Metro Area! Do your live in the Denver Metro Are and a professional HVAC technician to take care of your residential heater furnace repair? Our furnace repair experts are ready to address and resolve any heating issue you may be having, from a simple repair, standard and/or routine maintenance, to more urgent situations like an emergency furnace repair. With over 40 years of combined HVAC experience, the superior service from our local furnace repair technicians provide has earned the trust of many Colorado residents. All of our heating technicians are industry certified and all of their heater repairs, maintenance, installation and replacements, are covered by our 100% Satisfaction Guarantee. All of our Denver heating repair technicians are industry certified (N.A.T.E. and EPA) and go through an extensive background checking & drug screening process before being hired, so you can trust that all the heating service technicians we send are highly qualified to get the job done right, truth-worthy and safe to have in your home! Or, click here to schedule your furnace repair service online. We understand how the cost of furnace repair service could worry homeowners, which is why we've gone the extra mile to provide you with chances to save money along each step of the way, from initial furnace repair coupons below, to heating rebates when you upgrade to a new high efficiency unit, and finishing with financing options to make any cost more affordable! Have one of our licensed & insured heating contractors visit your home and diagnose the furnace problem you're facing for just $22! 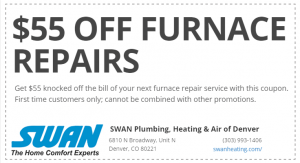 Save $55 off your furnace repair service when you use this coupon! Valid for new customers only & cannot be combined with other offers. Don't need repairs, and not ready to install a new heating system? Have your furnace tuned up for just $49 with this coupon. We aren't the only ones who believe our furnace repair services are among the best in Denver; look at what our latest satisfied homeowners have to say in these furnace repair reviews! Our furnace stopped working and they came out on a Saturday just a couple hours after we called. Spencer was very knowledgeable. He fixed the problem quickly and cleaned up other details that previous companies had missed. My family is forever grateful to John, from Swan Plumbing and Heating, for finding all that was wrong with our furnace. We had 2 other inspections done and was told nothing was wrong! Our furnace had filter, wiring and no return venting errors! I recommend John and Swan Heating 110% for all heating, plumbing and air problems. This company has honest, efficient and knowledgeable technicians. Thank you so much for helping my family have a safe, warm home. Spencer was very personable and took the time to explain not only to me but to my husband (over the phone) what needed to be done to fix our furnace. He was thorough and made sure all was functioning properly before he left. He spared us a second cold evening!! Jenesis was also very helpful in getting us an appointment quickly. We were nervous that we would have to wait days (during a super cold stretch of Colorado weather) but she was able to get someone to our home within 24 hours. These are only a few of our furnace repair reviews, you can see many more on our Plumbing, Heating & Air Conditioning Reviews page! If you are a customer and would like to leave a review, click here. Both blower wheel and blower motor will be replaced when the furnace blow motor need replacing. This can limit annoying blower noise and prevent premature failure of the replacement motor bearings. Very often, a failed furnace circuit board is only one component in a chain of failed controls. Sometimes it can be difficult, if not impossible, to locate all of these component failures in on a single service call. Trying to salvage suspicious components in an effect to reduce costs may actually wind up costing more in future furnace repairs. Delayed gas ignition can be a serious problem. Light-off / cross-over burners must be properly aligned. Flue passages must be checked and burners properly adjusted by your service professional. If your furnace is over 10 years old and has a delayed ignition problem, it is wise to replace it. Today's furnaces utilize much safer gas ignition systems than those of older units. There are many types of gas valves in use today. Often, failure of one component in the gas control system can affect the dependable performance of other components. Replacing the gas control system makes good repair sense. If we discover that you have a non-100% shut down gas control system in your furnace, it must be replaced, not repaired. Older gas systems are outdated and unsafe. A safety inspection if performed on the heat exchanger every time we perform furnace repairs or maintenance service. An infrared heat exchanger inspection should be an annually scheduled procedure. Your family's safety depends on it. It if critical to have your flame sensor cleaned every season. Failing to do so will cause the hot surface ignitor to cycle too frequently as it attempts to light the furnace burners. This, in turn, causes the HSI to burn out prematurely. Annual furnace maintenance makes sense. It can actually cost less to maintain a furnace than to replace the HSI every one or two years. Most inducers are provided as complete assemblies by the manufacturers. We agree with that approach and strongly recommend not only replacing Inducer motors or other Inducer parts. Many times a faulty pressure switch can cause an Inducer to fail prematurely.